Graduate student Alec Momont of TU Delft has designed an unmanned, autonomously navigating mini aeroplane that can quickly deliver a defibrillator to where it is needed. 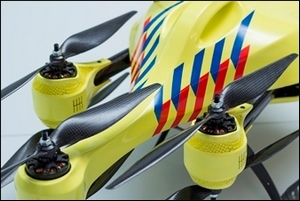 A network of such drones could significantly increase the chance of survival following a cardiac arrest: from 8% to 80%! Alec Momont of TU Delft's Faculty of Industrial Design Engineering designed his prototype for an ambulance drone together with the Living Tomorrow innovation platform as part of his graduation programme. When the emergency services receive a cardiac arrest call, this unmanned, autonomously navigating aeroplane can quickly deliver a defibrillator to the emergency scene. Via a livestream video and audio connection, the drone can also provide direct feedback to the emergency services and the persons on site can be instructed how to treat the patient. The drone finds the patient's location via the caller's mobile phone signal and makes its way there using GPS. The drone can fly at around 100 km/h, weighs 4 kg and can carry another 4 kg.